Enjoy sparkling pink sand beaches, charming colonial houses and more on a cruise to Bermuda! Located off the coast of North Carolina, Bermuda is an island nation unlike any other. Boasting a rich colonial history as well as immaculate sweeping beaches, a trip to Bermuda is worth it for history buffs and beach bunnies alike. The 22-mile-long island is divided into three areas, each with their own unique attractions. Most visitors traveling via cruise ship will arrive at the Royal Naval Dockyard, also known as King's Wharf, located on Bermuda’s west end. Once an important military stronghold, the West End is particularly tourist-friendly today, with marvelous shopping and attractions to satisfy every taste and style. The centrally-located city of Hamilton is the nation's capital and has a thriving arts and cultural scene. And the historical district St. George, on the east end, contains picturesque colonial architecture and is a UNESCO World Heritage Site. Despite Bermuda's popularity as a cruise destination, there's no need to worry about crowds. For those willing to travel a little off the beaten path, there are plenty of secluded spots where travelers can enjoy their own private beach getaway. Once a Royal Navy stronghold, the Royal Navy Dockyard is now home to several unique Bermudian attractions. Passenger ships will call at one of the two piers at the dockyard, King’s Wharf or Heritage Wharf. Boasting a rich maritime history, visitors can learn about the military origins of the port at the National Museum of Bermuda, or satisfy their shopping needs at a local market or mall. The Royal Navy Dockyard also offers easy access to the capital city of Hamilton and its surrounding beaches and parks, easily accessible by public transportation. Hamilton is the bustling cosmopolitan capital of Bermuda and the heart of the nation. Here you will find lush botanical gardens, vibrant nightlife and beautiful parks. Its pastel storefronts and dazzling blue skies make it the perfect backdrop for a scenic vacation. Hamilton offers plenty of opportunities to experience Bermuda's culture, history and outdoors. Two separate art museums boast international art collection. Historic forts offer the perfect place to learn about Bermuda's colonial past. And adventurous visitors will relish the chance to snorkel or dive among the underwater shipwrecks and coral reefs. The smallest of Bermuda's cruise ports, St. George's Harbour provides easy access to Bermuda's historical district and former capital, St. George. 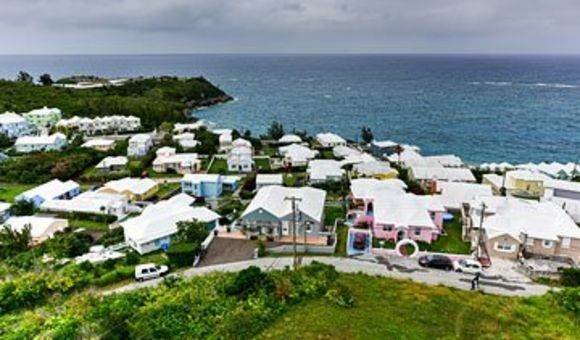 Located on the northeast tip of the island, St. George is a colonial village frozen in time. It has been named a UNESCO World Heritage Site for its well-preserved downtown. Expect beautiful, pastel-painted buildings separated by winding cobblestone streets. At the heart of the city lies King's Square, the picturesque main plaza containing the Town Hall, the Bermuda National Trust Museum, and other historical buildings. The popular cruise port King’s Wharf provides easy access to Bermuda’s West End. Here, you’ll have the opportunity to explore the island’s historic naval dockyard, go shopping at the nearby Clocktower Mall, or head on down to the nearest beach. One of the best-kept secrets of West End is Whale Watch Beach. Turquoise waters contrast against a pink sandy beach, and the gentle surf is inviting for wading and swimming. Every spring, the beach is visited by its namesake marine mammal. Bring your binoculars to catch a glimpse of the humpback whales without ever having to leave dry land. Book Now If you need any more information on Bermuda cruises, do not hesitate to call our cruise experts at 1-888-403-1425. Looking for the cruise around the world? Call today and find out more about our Bahamas cruises. If you have a short time until you travel, then browse through our last minute cruise deals or our 3 day cruises. All cruises are available through our cruise experts or on our homepage.